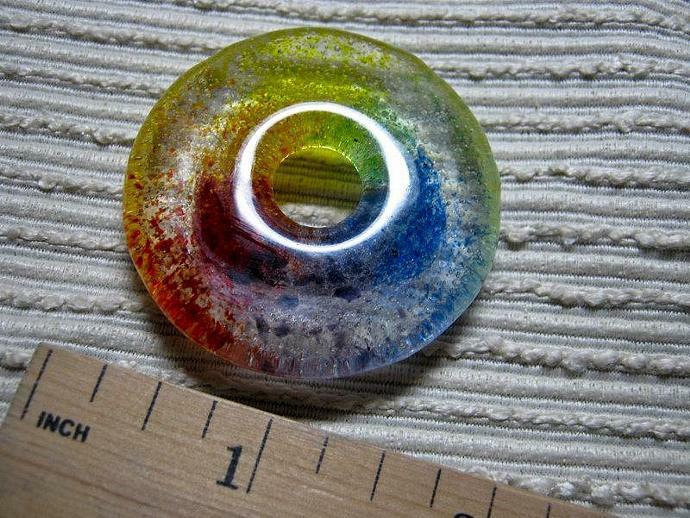 THIS CIRCLE MULTI-COLORED WORRY BEAD PENDANT FOCAL is created by layering clear glass frit with small bits of red, orange, yellow, green, blue, and purple frit glass into a mold to create a triangle bead and then melting to 1425 degrees in a glass kiln. 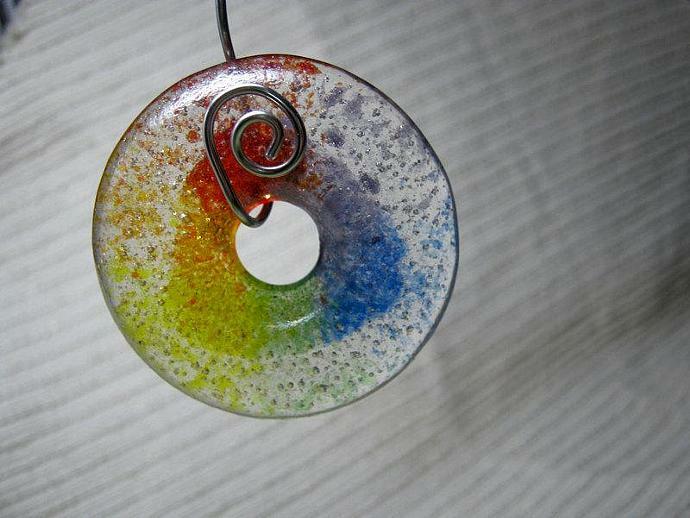 This rainbow triangle is then re-fired into a round donut with additions of clear and rainbow colored frit. Bead is approx. 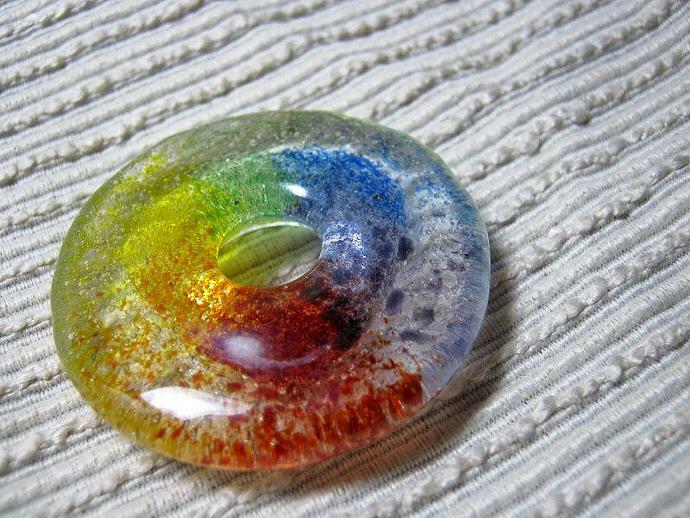 2" in diameter with a 3/8" hole. 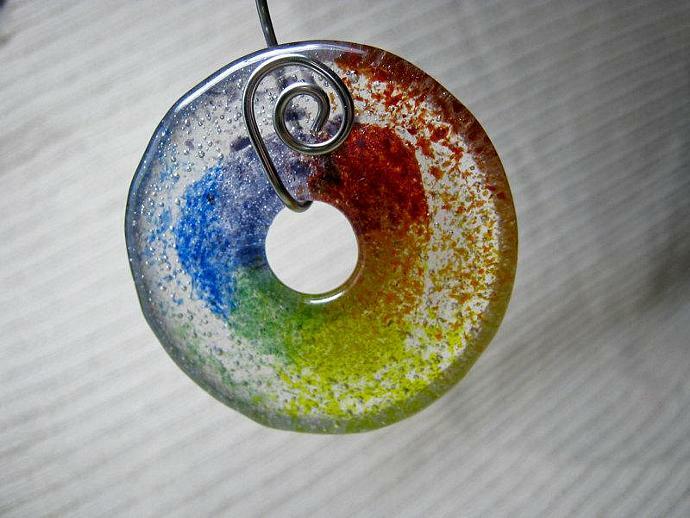 This one has a delicate effervescent 'bubbly' effect. ADD YOUR OWN RIBBON or CORD, along with your creativity to transform these jewels into a unique necklace or to embellish a felted or knitted scarf, handbag, or other crafty creation.This bead is silky and smooth to the touch on one side and delicately textured on the other side...great for use as a tactile meditation tool to counteract any worries. WANT MORE? If you would like more for a special project, I will be happy to make them for you. I can even create custom blends for you in a variety of other colors. I can also make them round. Custom orders require about a week to create and ship. Please 'contact the owner', if you need more than what is offered here or a custom blend. Remember that any custom made beads will be very similar to those pictured above, but not exact, as each bead is individually made by hand. 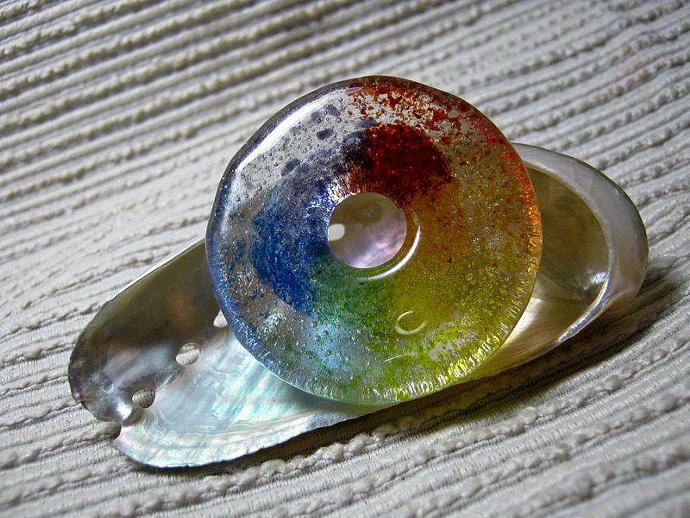 THIS GLASS BEAD IS KILN ANNEALED for strength and durability, but, it is still fragile if dropped on a hard surface.